Child homelessness is a problem too big to ignore but small enough to be solved if all sectors of our community come together to address it. The first year of life is the time a person living in the United States is most likely to be homeless. The age group with the second highest incidence of homelessness is children between the age of one and five years old. A growing body of research shows that homelessness is a traumatic experience that negatively impacts children's health and development. The negative impacts of homelessness on childhood wellbeing increase as the length of homelessness increases. Our community has the ability to reduce the number of nights children spend in homeless shelters. 1,534 children under the age of 18 lived at a homeless shelter in Salt Lake County in 2018. Several hundred more spent at least one night at a shelter for victims of domestic violence. 51 percent of families with children that enter a homeless shelter leave within a month. 32 percent leave between one month and three months. 13 percent stay for between 3 months and 6 months. Only one percent of homeless families stay in a shelter for nine months or more. 1. Increase the number of apartments low income families can afford by producing new units and preserving existing affordable housing that is safe and appropriate for families with children. 2. Increase the number of permanent supportive housing units available for the most vulnerable homeless families. 3. Increase the income of families who experience homelessness by connecting parents to adult education and job training and providing the support parents need to benefit from these opportunities. 4. Increase access to childcare so that parents have a safe, caring place for their children to learn and grow while they are earning money or working to increase their income capacity. 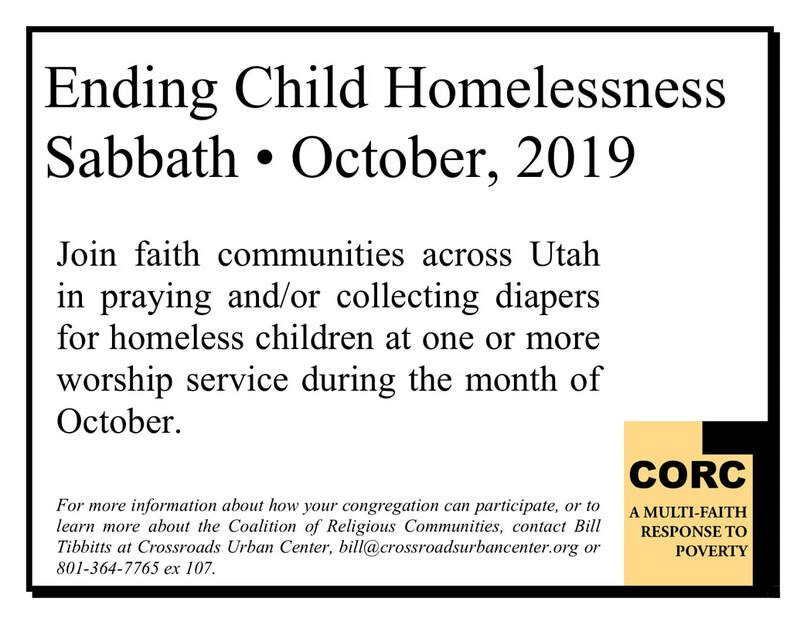 The Coalition of Religious Communities is asking clergy, congregations, community organizations, candidates and elected officials in Salt Lake County to sign the above pledge to help reduce child homelessness. If you are willing to sign the form please enter information about yourself and any organization or group you represent below. ​The Utah state legislative session ended last week. One major disappointment from the session was the failure of legislators to address the housing affordability crisis in the state budget (as described in this Deseret News article). This failure of state officials adds to the growing sense that bold federal action is needed to address this crisis-- as is reflected in this article written by Senator Elizabeth Warren. 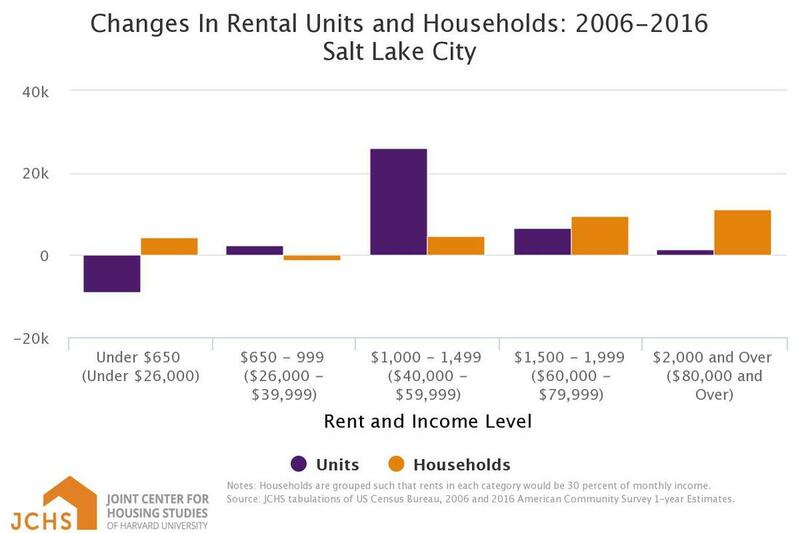 We have been talking about how we can better highlight the connection between the housing affordability crisis and child homelessness in Utah. One idea we have been developing is to create a pledge to help reduce child homelessness that could be signed by clergy, congregations, candidates for municipal office and elected officials. A draft of a pledge for Salt Lake County can be found here. Similar pledges could be produced for Weber, Utah and Davis Counties if there is interest. What do you think about this approach to drawing awareness to child homelessness and how the housing affordability crisis helps to produce child homelessness? Call Bill Tibbitts at 801-364-7765 ex 107 if you have ideas for improving this pledge or helping to get people and organizations to sign it. This video talks about highlights from a study looking at the impacts of homelessness on children's health. You can get a copy of the entire study here. 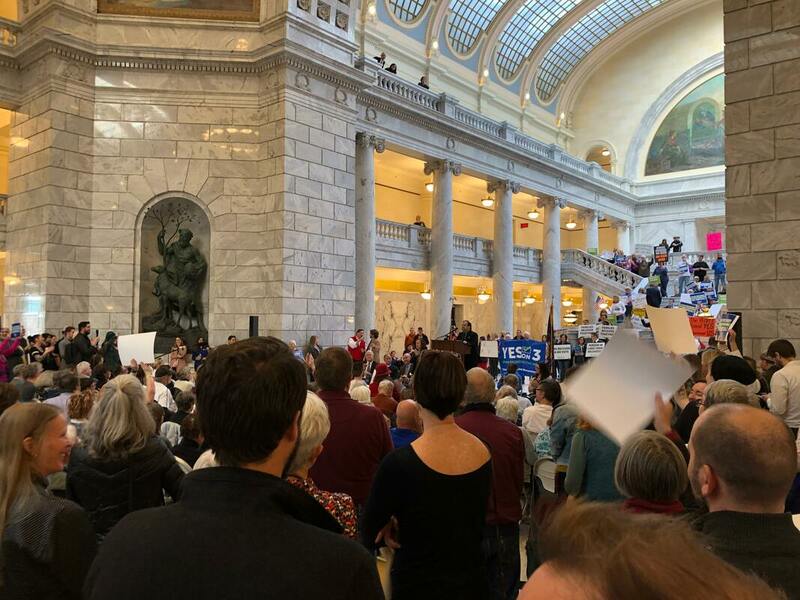 On Thursday, January 31, 2019, over 100 people of faith gathered at the Utah Capitol for the Coalition of Religious Communities annual Faith & Poverty Day. The event was discussed in news stories in the Deseret News, Salt Lake Tribune, Fox 13, KUER and elsewhere. We are so grateful for everyone who came and participated, particularly our featured speakers, the Right Reverend James Gonia, Bishop of the Rocky Mountain Synod of the Evangelical Lutheran Church in America and Rev. Joan Bell-Haynes, Executive Regional Minister, Central Rocky Mountain Region, Christian Church (Disciples Of Christ), USA and Canada, Rabbi Samuel L. Spector of Congregation Kol Ami, Salt Lake City Mayor, Jackie Biskupski and Senator Luz Escamilla. In the past couple days I have had a couple ask me what I mean when I say that Senator Allen Christensen's SB 96 "repeals" Proposition 3. The easy answer to this question is that the bill makes major changes to Proposition 3 and that many of those changes will be worse for low income people who currently do not have a way to pay for basic healthcare. A better answer is that SB 96 does not have a back up plan for providing ongoing coverage to Utahns in poverty if the federal government does not agree to allow Utah to ignore federal Medicaid rules. The core of SB 96 are two "waiver" requests asking federal officials to waive federal Medicaid rules for Utah. If those waivers are granted by the federal government then SB 96 will potentially ensure that most of the people who would have gotten coverage through Proposition 3 are eligible for some kind of free or very low cost healthcare plan. Unfortunately, we have no way of knowing now if those waiver requests will be approved. If they are not approved then no uninsured person who would have been covered by Proposition 3 will get coverage. I have friends who think there is a 90 percent chance that the waiver requests will be denied. Conservative think tanks are opposing this idea and, with presidential primary debates set to begin in June, it is unlikely that the President is going to do anything that alienates conservative voters this year. These friends' confidence that the waiver will be rejected is the reason they are so adamant that SB 96 is a complete repeal of Proposition 3. The sponsors of SB 96 have the opposite opinion. They have been talking to the people in the federal government who decide whether or not waivers are granted and say they have been all but promised that the waiver will be granted. I think they believe this and are very excited for Utah to show other red states how to expand Medicaid while spending less money. I went to the presentation on SB 96 in committee yesterday and the thing that made me nervous was that the bill sponsor said that he was confident the waivers in this bill would be approved because it included changes to a bill that passed last year that the feds asked be included. The reason this troubled me is that the same federal officials who are apparently telling state officials they want to approve the waiver ideas in this year's bill were allegedly saying the same thing about last year's bill. This makes me worry that on Medicaid expansion Utah officials are playing the role of Charlie Brown, lining up to kick a football, while the federal officials are playing the role of Lucy, perpetually moving the ball out of reach every time state officials get close to touching it. I am also concerned because the Trump administration has an unprecedented level of turnover. It is possible that whomever is encouraging Utah officials to apply for waivers now is not going to be the person who makes the decision to approve or deny them if they are submitted. For the sake of argument, let's agree to assume that there is a fifty percent chance the waivers in SB 96 will get approved and a fifty percent chance they will not. That means there is a fifty percent chance SB 96 will fully repeal Proposition 3 and lead to the completely elimination of Medicaid expansion. As a voter who enthusiastically voted for Proposition3, that outcome is not acceptable. I understand why state officials are hoping to convince the federal government to let them do Medicaid expansion in a way that involves the federal government spending more and state government spending less. Bargain shopping is something most people can relate to. What I cannot understand is why uninsured people in poverty have to be the ones who suffer if state officials fail to haggle their way to the bargain they are seeking. It would be different if legislators were the ones who lose healthcare if the deal falls through. It would also be different if the SB 96 had a back up plan for providing coverage to uninsured Utahns in poverty if its waiver request fails. The bill does not have that back up plan and so I am going to continue to refer to SB 96 as a repeal of Proposition 3.